In Brief: Visit the deservedly famous Jiuzhaigou National Park and then head on to nearby Huanglong, an equally scenic but less well-known area of still ponds and coloured rocks. A mossy tree trunk partially submerged in the clear blue water of Five Flowers Lake, Jiuzhaigou National Park. See the best of the deservedly famous Jiuzhaigou National Park – waterfalls, forests, and the amazing colours of calcified stone covered by limpid pools – head on to nearby Huanglong for a day of easy walking by the forests, pools, and natural rock terraces in this equally beautiful scenic area, and take a walk up to the big waterfall in Munigou Park, a pretty but less well-known area. As well as taking in all the natural beauty, we include visits to ancient towns, temples, and monasteries, making sure to sample the spicy Sichuan specialty snacks and food. UPDATE: We got word that Jiuzhaigou has reopened. This trip is all go! Day One—Fly to Huanglong via Chengdu, explore Songpan Ancient Town. Day Two—Hiking and driving around the key sites of Jiuzhaigou. Day Three—Hiking around Huanglong National Park. Day Four—Visit Munigou Park, private bus back to Chengdu. Day Five—Visit temples and food street in Chengdu, Huanglongxi Ancient Town, fly back to Beijing in the evening. Jiuzhaigou and Huanglong National Parks are hidden in the mountains of the Ngawa Tibetan and Qiang Autonomous Prefecture, in the north of Sichuan Province. The main ethic group in this prefecture is Tibetan, with the Han and Qiang ethic groups making up the majority of the remainder. The area was largely unknown to outsiders until 1975, and, after a bit of exploitation by loggers, was declared a protected national park in 1982. 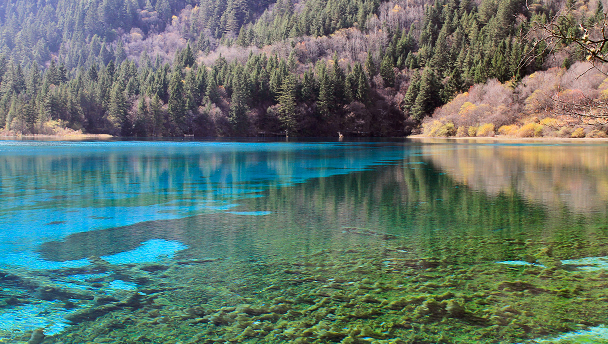 Since 1992 both Jiuzhaigou and Huanglong have been UNESCO World Heritage sites. Before the Huanglong Airport was built reaching the parks involved a long drive along twisting mountain roads. Flying in to Huanglong Airport allows us to cut down on the travel time to the parks. A clear lake surrounded by pines in Jiuzhaigou National Park. The name Jiuzhaigou translates as The Valley of Nine Villages. Seven of the villages are still populated, and as at 2003 there was a permanent population of around 1,000. Previously residents worked farms and fields, but now the focus is on tourism. Many of the residents are of the mountain-dwelling Qiang ethnic group, who carry on the old traditions for styles of clothing and hair. An interesting fact: some of the Qiang trace their line of descent through the female side, instead of the male side. Nearly half of the 720 square kilometers of Jiuzhaigou is covered by virgin mixed forest, an amazing sight when covered by autumn colours. Even more amazing would be to spot one of the Giant Pandas or Golden Snub-nosed Monkeys, two endangered species that are said to inhabit the forests in tiny numbers. However, the most well-known features, and the focus of our visit, are the greens and blues of the many lakes in the valleys. The colours of the lakes depend on the depth of the water and the concentration of different minerals in the water. We‘ll use the park bus system to cut out some of the longer walks between scenic spots, but still hope to get some good walking in. ‘Five Flowers’ is a shallow lake surrounded by stunning scenery, with ancient fallen tree trunks and branches clearly visible in the water. Named for allegedly being a favourite drinking spot of Giant Pandas, Panda Lake feeds the multi-level, multi-stream Panda Waterfalls, said to be the oldest in the valley. Atop the Pearl Waterfall are the Pearl Shoals, a broad expanse of rocks covered by brightly-coloured algae and plants. The water flows over a broad, rocky cliff, dropping from heights of up to 40 metres. Huanglong Temple, seen behind the travertine terraces of Huanglong National Park. Travertine is a type of limestone formed by the buildup of minerals from spring water. It‘s usually porous, which makes it easy for colourful plants and algae to grow in and on top of it. Buildups of travertine often take the shape of terraces, which Huanglong is famous for. Other places that are well-known for travertine terraces are Yellowstone National Park and Mammoth Springs in the U.S.A., and Pammukale in Turkey. 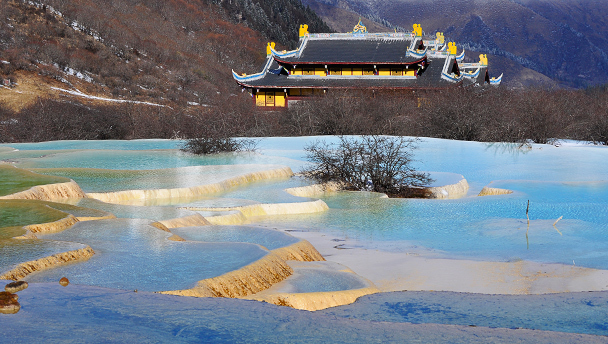 Huanglong translates as ’Yellow Dragon‘, a name given to the 3.6km long gully filled with pools and ponds of clear water covering colourful mineral deposits and concentrations of algae. Yellow Dragon Gully itself is surrounded by scenery worth a mention: forests of spruce trees at the lower altitudes, and alpine meadows and permanently snow-capped peaks further up. In the heights of Huanglong is the Huanglong Temple, a Buddhist temple at the head of the main body of water in the gully. After taking the cable car up to the Snow Peak area, we‘ll make a 3-4 hour hike down the boardwalks of the park. On the way down, we‘ll pass all the key sights: the Colourful Calcification Pond, the Yucui Colourful Pond, the Golden Sand Beach, and the travertine pools known as the Dragon‘s Scales. We‘re travelling a little outside peak season and hope to avoid huge crowds at both Jiuzhaigou and Huanglong. We still may encounter large groups of tourists in the more popular areas. 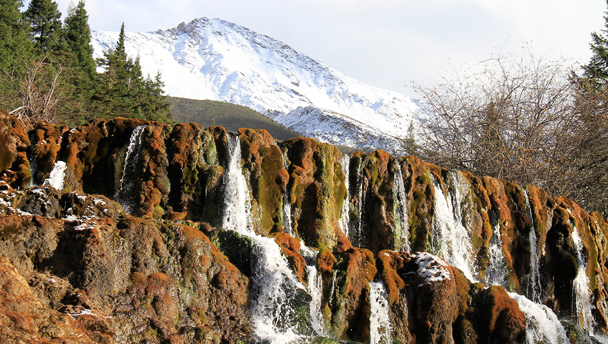 Snow-covered mountains behind a waterfall in Munigou National Park. Also in the area, and also very scenic, is the Munigou Park. A little further off the tourist trail, Munigou is quieter than both Jiuzhaigou and Huanglong. We‘ll walk up into the park to get a good look at the tall waterfall and take another path back down to the bottom, passing through forests and walking by small ponds, pools, streams, and more waterfalls. While in the area, we‘ll explore two ancient towns: Songpan, and Huanglong Xi. Songpan is an ancient walled city, first built during the Tang Dynasty (618-907), and fortified with thick walls during the Ming Dynasty (1368-1644). It‘s currently inhabited by around 70,000 people - an interesting mixture of Tibetan, Qiang, Hui, and Han ethnic groups. Huanglong Xi contains temples, archways, ancient houses and trees, split by a waterway that made it a regional center of trade in times gone by. We‘ll explore the alleys and lanes, and see if we can pick up a few trinkets from the streetside souvenir sellers. The last night of the trip we‘ll stay in Chengdu, the capital of Sichuan Province. While in town, we‘ll investigate the Temple of Great Compassion, and the Wuhou Temple before taking a stroll down the Jinli Snacks Street—a good way to get a look at the different culture and tastes of Sichuan Province. The Jiuzhaigou and Huanglong National Parks cover altitudes of between 2,000 and 3,500 metres above sea level. That‘s high enough that you might feel the effects of altitude sickness. For most people, this means sluggishness and perhaps a headache, but if you‘ve had altitude sickness before you may feel the effects more strongly. On this trip we‘ll be at altitudes between 2,000-3,500m, making it necessary to bring warm clothes. There‘s quite a difference in temperatures at day and night. Shaded areas may be quite cold. There's a chance of rain, so bring a waterproof jacket. At this time of year we expect temperatures of 10-15°C during the day, with temperatures nearing 0°C at night. We‘ll stay three nights in a 3.5-star guesthouse in the town of Chuanzhusi, and one night in a 4-star hotel in Chengdu city. You‘ll be sharing a room at the hotel with another hiker. If you'd like a hotel room to yourself, it can be arranged at an extra cost of 1,200 RMB for the trip, if a room is available—usually not a problem! We‘ll take most of our meals at restaurants, eating local Chinese food. We‘ll provide snacks and ingredients to make tasty sandwiches to eat while we‘re in the Jiuzhaigou National Park, and we‘ll supply more snacks to keep you going until a late lunch after our Huanglong visit. You might like to bring along a few treats for yourself as well! Please let us know if you have any special dietary requirements or food allergies. Warm clothes in case it is chilly in the evenings. Meals and water as described. All times are approximate, and depend on our speed of movement. See 35 photos from a trip to Jiuzhaigou, Huanglong, Songpan Ancient Town, and Chengdu. The Jiuzhaigou photos are amazing! In 2011 we made a scouting trip to this part of northern Sichuan, and in 2012 we made our first group visit to the area, visiting the Jiuzhaigou National Park and the Huanglong National Park, and exploring two of the ancient towns in the area. Click through for photos and more! 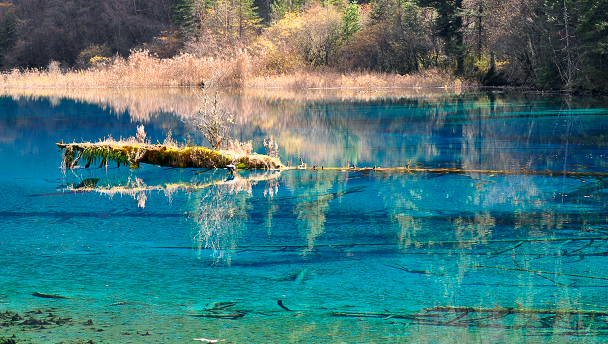 In November 2011 Huijie and Yanjing headed south to Sichuan for a scouting trip to the Jiuzhaigou National Park, and the surrounding area. Their tasks: figure out how to best organise a trip down there; try out the accommodation and restaurants; and take as many photos as possible! Click through to see the results of the photo-taking task!